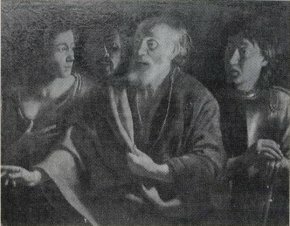 17/8/08 — Fundraising appeal — Paris, Musee du Louvre — Will Saint Peter’s Denial by Antoine or Louis Le Nain (ill.)  finally find a home at the Louvre ? The ongoing serial first started when the painting “was found in an attic in Luneville”  and sold at auction in Nancy on 19 March 2000 with an attribution to the 17th century Lorraine School. Estimated at 200,000 francs, it was acquired by the Parisian dealer Charles Bailly for 9.2 million francs (including charges), despite the presence of French museums representatives who had not been able to come up with the funds at the time. End of the first installment. In the second episode, the work had its export certificate denied on 21 July 2000 provoking Bailly’s ire, who had probably acted on behalf of an American client . The work was finally sold to an insurance company (AXA). The third installment is just starting and we hope it will have a fortunate outcome. An appeal for fundraising has been launched in the Journal Officiel dated 14 August 2008 for its acquisition by the Louvre. The price has been established at 11,500,000 euros (in comparison, it was auctioned off in 2000 for 1,500,000 euros …). We were not able to find a better photograph than the one above which appeared in the press at the time. Gazette de l”Hotel Drouot, 24 March 2008. See Le Monde dated 20 October 2000, Monique Raux, L’Etat retient en France un tableau des frères Le Nain. See Pierre Rosenberg, Tout l’œuvre peint des Le Nain, Paris, 1993, p. 70. The last religious painting by the Le Nain brothers sold at auction, a Mary Magdalene, (oil on canvas – 55 x 62,5 cm) was sold for 120,000 euros with charges at Drouot in Paris on 16 December 2005.